CALCIUM - Important in teeth and bone development. Pregnant women need plenty of high-calcium foods, in order to start their baby to strong teeth and bones. Calcium still helps throughout life for your bones, and to some degree your teeth. Almost 75% of women don&apos;t get enough calcium each day. Later years can/will develop periodontal disease and osteoporosis. Sources: >1000 mg/day recommended - milk, cheese, yogurt, ice cream, green leafy vegetables, tofu, and fortified foods (Orange Juice), also supplements. VITAMIN C - >60 mg/day recommended. If not enough, you are prone to periodontal disease. Body uses it as antioxidant, strengthen bones and blood vessels, growth, tissue repair and wound healing, resistance to infection. Foods: When exposed to 02, calcium degrades so eat Vitamin C foods soon after opening. Example - Orange Juice, cantaloupe, red and green peppers, mangoes, broccoli, red cabbage, cauliflower, spinach, tomatoes, soybeans, strawberries, and raspberries. CARBOHYDRATES - [sugars], bacteria eat it and release acids and tissue-damaging factors. The more you eat; the more chance of tooth/gum damage. Example - soda, juices, candy, jellies, etc. Phosphorus level high, and can leach calcium out of your teeth and bones. Counteracts calcium in foods also. How often - less is better (less between meals). Texture of food - sticky, wadding foods limit (fruit rollups, gummy candy, raisins, crackers, and chips). Slow to dissolve foods - cookies, granola bars. Meal time - when eaten at a meal, will be washed away better by chewing, drink, and saliva. In-between meals lower saliva and may not drink to rinse. Parents want the best they can provide for children. Dental care is one need, and it is important to start your child&apos;s oral health maintenance correctly. I will discuss a few key points, and your general dentist or pedodontist can provide further information. For an infant, clean the gums and erupting teeth with a wet washcloth or soft toothbrush. As more teeth erupt, use a pea-sized amount of toothpaste on the soft toothbrush in a gentle, light brushing action. If you put an infant to bed with a bottle, make it water only. "First visit by the first birthday" is the advice of pediatric specialists. This is to establish an early prevention program for your child. A visit every six months thereafter is recommended. Teething pain from six months to three years old, on average, can be alleviated with a teething ring, cold wet washcloth, a chilled teething ring or massaging the gums. Avoid using a lot of gel products. Thumb or finger-sucking is common, but should stop by age four. If allowed to continue, it can create crowded or protruded permanent teeth. Your dentist can help if this is a problem. Diet is very important. Your child needs a balanced diet, not overloaded with carbohydrates. The "carbs" come in the form of sugars (in processed juices, fruit roll ups, candies and jellies) and starches (in potato chips, bread, crackers, pretzels and pasta). These carbs will make your child more susceptible to cavities. Gum and soda should be limited and sugar-free. ​In summary beware of frequent snacking, brush well two or three times a day, floss once daily, and use a flouride toothpaste. Go to your dentist&apos;s office every six months, and he/she may recommend sealants and flouride treatments. You&apos;ve watched the Makeover shows on TV. You have seen that dentistry can offer life-changing results. Dental work must function adequately under great stresses of chewing, grinding, nail-biting, etc. Dental implants, when appropriate, can offer great function and cosmetics. Dental implants have a track record over the last four decades. To [over] simplify, a dental implant is a titanium-metal anchor in the jawbone, meant to replace the root of a missing tooth (or several teeth). On top of the implant can be placed a crown, bridge, or removable (false) teeth. The benefits of implants can be many. They provide a natural-looking cosmetic enhancement by filling the space of a missing tooth. They provide a secure and comfortable function for replacement teeth, even stabilizing dentures. Implants can eliminate the need to grind down other natural teeth for a bridge. They help prevent deterioration of the jawbone caused by loss of teeth. Implants can give you increased confidence in laughing, smiling, speaking and eating. You will look and feel better. Implants must be placed under certain guidelines and not every person or situation is correct for implants. Some specialists and fewer general dentists place implants. 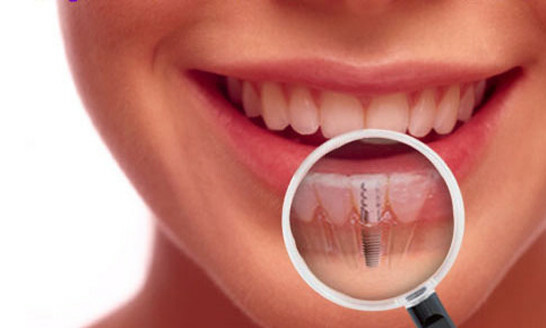 You should talk to your dentist if you are interested in a dental implant. If you are missing one tooth or more, you may greatly benefit functionally and cosmetically from dental implants. Rationale - to maintain the teeth and gums in &apos;a healthy state&apos;. To identify the good things patients are doing as well as problems or pathology. Timing - in general every six (6) months for adults and children. This is to be able to see cavities, periodontal disease or other problems early, rather than progressing over a year or more. Sometimes, depending on conditions, recommend more frequently (3 or 4 times a year) Ex. - periodontal disease, dry mouth, cavity history, cancer treatments, pregnancy. Scaling, polishing teeth to remove bacteria, debris and stain. It is therapeutic and preventive. Discuss oral hygiene recommendations, habits, etc. "It&apos;s not just a cleaning, scraping or polishing". Started as a brush-on teeth. Didn&apos;t work very well. ~ 15 years ago developed tray method, to hold gel on teeth better. Improved results greatly. In last 10 years or so, "In-office", "Laser" Whitening has evolved with the demand for quicker, better results. Gels have been much more concentrated, the light/laser "superactivates" the gel. OTC bleaching - works in some cases, but less than dentist-prescribed. What is it? A concentration of peroxides that soak into teeth. Remove the color/stain from teeth. "Pearly White Teeth" - sign of youth, health, attractiveness. Can cause sensitivity temporarily (less now than years ago) if have receded gums, worn enamel. Abuse of bleaching gives an opalescent "bluish" look. Have natural, good tooth structure. Best if yellow/orange color (age, tea, coffee); grayish color (flourosis, antibiotics, smoking) less predictable. Many factors unique to "seasoned citizens" can make them more susceptible to a host of dental maladies. Specialized maintenance and treatment procedures may be needed to aid in attaining the best quality of life. The primary causes for dental concerns in senior citizens are [slow-down or malfunction of] body systems, poor nutrition, medications, loss of manual dexterity, and tooth wear. Some or all of these can be interrelated. Xerostomia is lack of saliva flow. This is due to age, medical conditions (Sjogrens Syndrome), smoking, and some medications. Decreased saliva flow results in high susceptibility to cavities and periodontal disease. Your dentist may recommend prescription rinses with fluoride or chlorhexidine antibacterial, artificial saliva, sugarless lemon drops to stimulate saliva glands, or talking with your physician to possibly change medications. Excessive tooth wear and stain occurs with time. Teeth will be unsightly, less efficient chewing, hypersensitive or even abcess. Your dentist may recommend fillings, crowns, or removing/replacing the teeth in some fashion. Periodontal disease can run rampant in seniors. This is due to smoking, poor hygiene from inability to brush and floss well, poor diet, decreased saliva or medical conditions (diabetes, Sjogrens syndrome). Periodontal disease is the most common cause of tooth loss in adults. Your dentist may recommend more frequent appointments, electric toothbrush, prescription rinses, nutritional counseling or referral to a specialist. Root cavities are more prevalent in seniors due to gum recession combined with the other factors discussed above. Loss or alteration of taste occurs due to lack of saliva flow, increased bacteria or fungus in mouth, taste buds decreased function, medications, poor oral hygiene, and dentures. Most of these factors can be addressed by prescription rinses, electric toothbrush, increased water intake, and proper care of dentures. Angular Cheilitis is the corners of the mouth being inflamed or infected. Often this is caused by drooping of the cheeks to increase folds, moisture trapped within, and possibly fungal infection in these areas. Local medication can help, as well as good dental work. Osteoporosis is a condition resulting in loss of calcium and bone mass. This can affect the jawbones as well as other bones of the body. Proper nutrition and, if necessary, supplements can be used to combat this. You can see that seniors may be afflicted with many dental problems. Solutions to these can include increased water intake, saliva substitutes, nutrition counseling including vitamins, fluoride or antibacterial prescription rinses, use of an electric toothbrush, more frequent dental visits (even if you have dentures), sugarless lemon drops, restoring teeth with good dental work, relining dentures or new dentures, taking dentures out for a few hours a day, and replacing teeth with dental implants for better comfort and function. Dental implants are an excellent way to replace missing teeth. Implants are titanium root-form cylinders placed into the jawbone. Restorations on these implants can be cemented crowns and bridges, or removable dentures with attachments to snap onto the implants for retention. These implants will make a huge improvement in chewing, aesthetics and confidence. Seeing a dentist regularly is a great first step on your way to restoring and maintaining good dental health. For further information on any of the above, please call your dentist. Frisco Smile Solution now offers OraVerse®, the first and only local anesthesia reversal agent; Numbness associated with dental procedures can be gone twice as fast! Frisco, TX, 2010 Frisco Smile Solutions is now offering OraVerse to patients who don’t want that lingering numbness after local anesthetics. After administrating OraVerse, a patient can return to normal sensation twice as fast. In clinical trials, patients have reported a return as quickly as 30 minutes after receiving OraVerse. For details visit www.oraverse.com. OraVerse is the first and only local anesthesia reversal agent that accelerates the return to normal sensation and function for patients who want to avoid the unwanted and unnecessary lingering soft tissue numbness following routine dental procedures. The first-in-class product was officially launched earlier this year by the San Diego based company Novalar Pharmaceuticals, Inc. The average duration of soft tissue numbness following the use of a local dental anesthetic is 3-5 hours. Numbness can lead to functional deficits. These deficits can result in difficulty with speaking, smiling, eating, drinking, biting of lip or cheek and uncontrolled drooling as well as give the patient a perceived sense of altered appearance. OraVerse has been proven to return a patient’s normal sensation twice as fast. OraVerse has an excellent safety profile. There are no contraindications and no known drug interactions with OraVerse. In clinical trials involving over 700 patients, there was no significant difference in adverse events versus control. ​Following parenteral use of phentolamine at doses between 5 to 15 times higher than the recommended dose of OraVerse (phentolamine mesylate), myocardial infarction, and cerebrovascular spasm and occlusion have been reported, usually in association with marked hypotensive episodes producing shocklike states. Although such effects are uncommon with OraVerse, clinicians should be alert to the signs and symptoms of tachycardia, bradycardia, and cardiac arrhythmias, particularly in patients with a history of cardiovascular disease; as these symptoms may occur with the use of phentolamine or other alphaadrenergic blocking agents. OraVerse is a registered trademark of Novalar Pharmaceuticals, Inc.